Remember that there is a service alert for New Year’s Eve/New Year’s Day (the federally observed one) TriMet service, so plan accordingly. 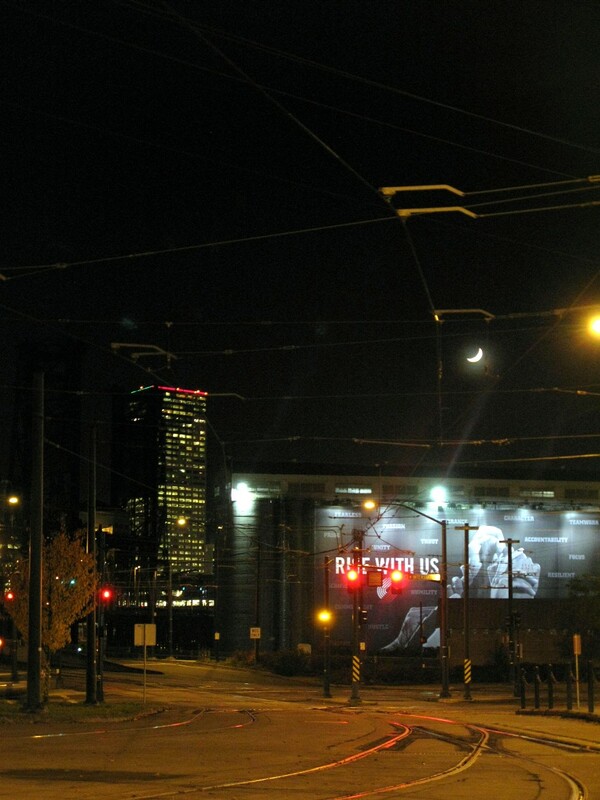 Everything (bus, MAX, streetcar) is running on Saturday schedules, and of those only MAX will have extended late night runs. Everything will be running on normal Sunday schedules. Service that is not typically run on Sunday (WES, some bus lines, etc) will not be running. Everything will be running on Sunday schedules for the observed holiday. Service that does not run on Sunday will not be running. There is an anticipated $12-17 million shortfall in TriMet’s operating budget for next year. In response, we’re given a false dilemma of a survey (as OPAL put it, “big fare hikes or really big fare hikes!”) where we’re presented with the illusion of choice on “some of the options” being considered – you’re not given all the options, just a few of them. Then after you’re done deciding how much service you want to cut and how high fares should increase (since you absolutely have to pick those to meet the $17 million mark), you can submit your answers to TriMet. Funny, for it being our core business and what we are striving to preserve, it seems to be the first place we’re looking to cut. But okay, YOU said it. Now I’m going to hold you to it. Honestly, the structure of this survey makes me uncomfortable because the results could later be presented without context (e.g. claiming that “80% of the respondents favored cutting service on the Red Line” while making no mention that that was the only MAX line put forth as an option, or that “Nearly all respondents approved of fare increases/service cuts at bus” even though you pretty much have to if you play the game to make the bar reach $17 million). The results can say whatever the powers that be want them to say because the choices are so limited. EDITOR’S NOTE: An earlier version of this post questioned travel expenses associated with conferences where Bibiana McHugh and Alan Lehto were speakers. Since posting, information was received from Lehto that the expenses for those conferences did not come from TriMet funds but were instead reimbursed by the conference organizers. My apologies for posting incorrect information, and those statements have been removed. I am concerned about how much money TriMet is spending on things are not directly related to providing public transportation service. How much money was spent to send TriMet employees (as best as I can tell, largely from Capital Projects/Planning) to the Railvolution conference in Washington, DC? I don’t know the answer to that question and am awaiting further information if all costs associated with Railvolution were covered by the conference organizers. However, if this money came from the TriMet fund, I know that cross-country flights aren’t cheap, then adding in conference registration, hotel/food costs, etc, we’re looking at probably thousands of dollars per person per conference. Don’t get me wrong, if money were no object, it looks nice for TriMet to have its name out there at conferences where people discuss things like Transit Oriented Development. Except money is an object. Is this really contributing to our core business, which I thought we just said was transportation service? Yes, I understand that registration and travel arrangements for those conferences were made months ago before the budget announcement, but moving forward I hope that all things that are not “Mission Critical” (and again, here I am working with the assumption that the mission is providing transportation service) are on the table for consideration to cut, and that includes things that do not have an immediate impact on providing transportation service, such as out-of-state travel for conferences. Take this recent example: the Oregonian’s Joseph Rose uncovered that TriMet spent $8000 on signs on buses and trains for the”#1 Transit” campaign (pictured above) based on findings from US News that said Portland was the best city for transit in the country. That sum was cringeworthy enough, despite TriMet’s defense that the campaign was done to “create greater awareness among our riders and the public in general.” And sure, $8000 is pocket change in TriMet’s overall budget, but enough needless spending like that will nickel and dime us to death. Of course, it didn’t help that US News rescinded their rankings – we’re actually #5. Oops. Well, that’s $8000 we’re not getting back. And another question that I haven’t seen anyone ask: Why are we outsourcing marketing when we HAVE a Marketing department? It’s pretty sizable, and it looks like a fair amount of money is budgeted towards the salaries/benefits of the employees in that division (info courtesy of the database of TriMet salaries from a few years ago that is primarily used to point fingers at how much operators make, and yes, I’m in there too.) But for the last ten years, the now-defunct external company ID Branding has been doing TriMet’s marketing and design work rather than TriMet’s own internal Marketing department. That means the 5 Dirty Words poems on buses and trains, the Green Means Go campaign surrounding the opening of the Green Line, the recent What Makes This Place Great? promotion (which, conveniently has been used to cover up the aforementioned failed #1 Transit ads on the trains – I suppose the fact that ID Branding is now out of business explains why the WMTPG website remains un-updated with several sections still “coming soon.” Hope we didn’t pay for that! ), the Rider’s Voice book aimed at helping people switch from paratransit to fixed route – all of these were outsourced to ID Branding. This really makes me wonder what our Marketing department is doing if we’re outsourcing marketing work to another company. Are these all things we can’t do in-house? How much money was spent on the ID Branding contract, and were we planning on spending more with any other marketing firms now that they’re gone? Can we maybe pick one or the other, either outsource all marketing or do everything in-house, but not both? EDIT: Numbers acquired. ID Branding contract was $1,862,437.00 budgeted, $1,497,547.95 billed, contract numbers ra020310ktx and rc070408dgx. Assuming we don’t outsource more marketing at the conclusion of the ID Branding contract, that’d be nearly $2 million saved. 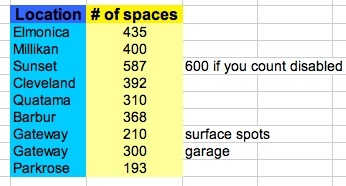 Total: 3195 parking spots that are filled every day, not counting the accessible-parking at Sunset. I’m making a conservative estimate. Now let’s continue to be conservative – let’s assume charging only on weekdays, even though ridership, especially on MAX, is pretty high during weekends as well, using the standard of 252 weekdays per year. And let’s assume a charge of only $1 to park your car all day – a veritable bargain compared to parking downtown and less than half of what it’d cost you (sadly enough) to take one of TriMet’s buses to those transit centers. You know what that yields per year? 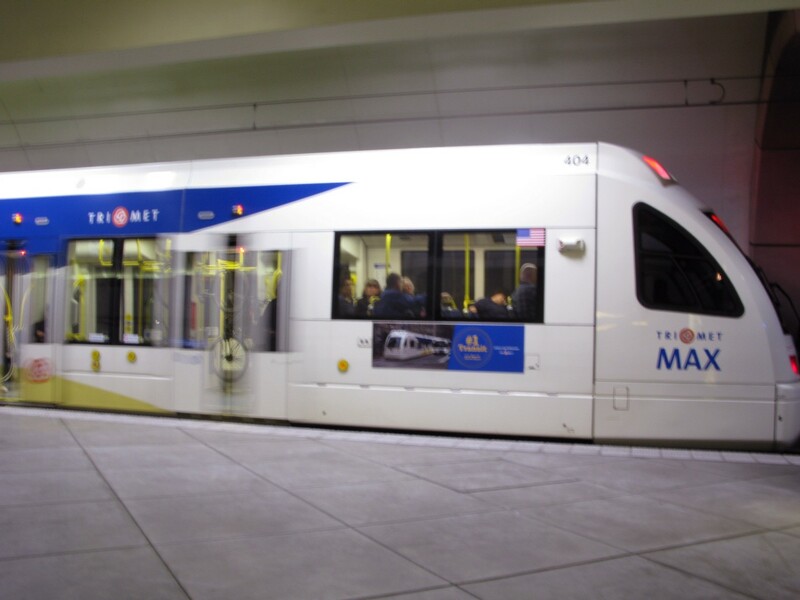 How did TriMet arrive at only $100,000? Even taking out a chunk of that for setting up some sort of payment/collection system, miscellaneous fees, frilly pants tax, etc, it should still be well over $100,000. Someone’s doing math wrong, and I’m pretty sure it’s not me. Actually I’m quite sure it’s not me – back in October Portland Afoot had crunched the numbers and came up with a similar result. But imagine if the cost to park your car all day in a park and ride was equivalent to an all-zone ticket (at $2.40, that’s almost $2 million per year). Or even better, an all-day ticket (at $5, that’s $4,025,700 in additional revenue annually). And what if we charged to park on weekends, or a smaller fee at the park and rides that aren’t as busy? Maybe this is socialist of me, but I’d sooner see choice riders get dinged a little more than the transit dependent, who don’t have other options and suffer a lot with even small fare increases. Not that there’s any differentiation in the survey on choice ridership – even though the demographics bit at the end says we want to preserve transit for those that need it the most, you can define your TriMet usage as “at least once per year” or “Never ride TriMet.” So the person who depends on a late-night bus or weekend bus to get to their job every day is categorized the same as someone who maybe takes MAX to the airport once a year or a Timbers game every now and then. I see. You know, I’m not even done yet and I think I’ve taken up more space than what’s allowed in the comment box on the survey. Hmm. Short line the Red Line? TriMet has launched an online budget tool to get input on how to address the anticipated $12-17 million shortfall. Users are presented with different options that are under consideration and can see how different combinations of them can be arranged to reach the $17 million goal. Among the options are several affecting Red Line service: not changing it at all, running it just between Gateway and PDX, and running it between 11th Ave and PDX. Oddly enough, that last one is how the Red Line used to be run for the first two years before it was extended to Beaverton TC in 2003, which helped accommodate growing ridership on the Blue Line. Several years later, additional trips during rush hour extended the Red Line further west. In the evening rush hour, for example, several Red Lines become Blue and terminate at Elmonica, Willow Creek, or Hatfield, and they’re replaced by other trains out of the Elmo yard or Blue Lines that turn Red. 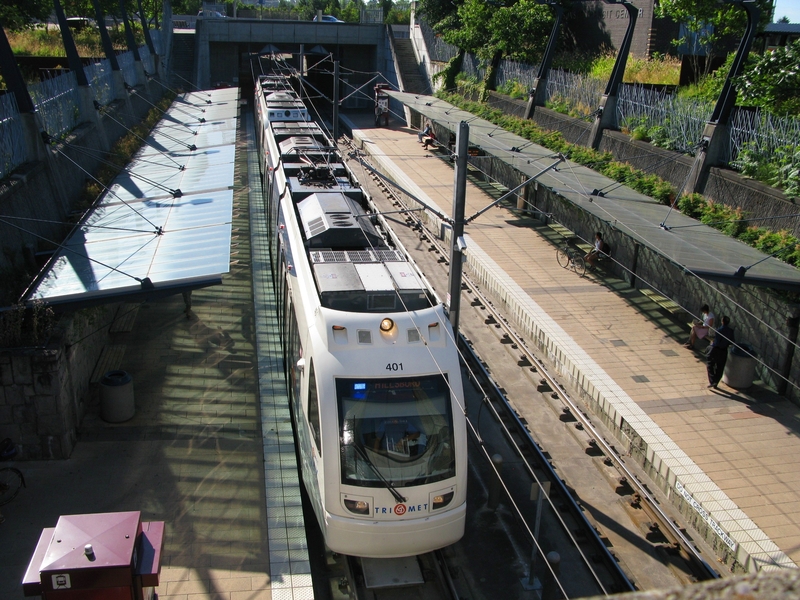 For example, Train 45 (a Red Line) leaves PDX at 4:42pm and becomes a Blue Line to Willow Creek. Instead of ending at BTC at 5:45pm to go back to the airport, it continues to Willow Creek, discharges any remaining passengers, and goes back into the yard. 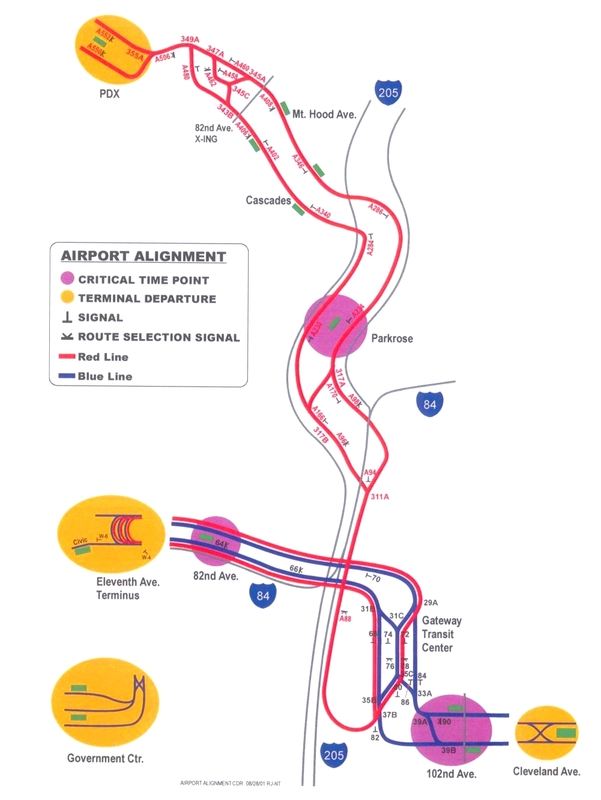 But then there’s no airport-bound Red Line sitting at BTC, so something else has to be there to take passengers to the airport. Enter Train 10, which is Blue all day until it leaves Hatfield at 5:24pm, when it becomes a Red Line arriving at Beaverton TC at 5:53pm (8 minutes after Train 45 went through westbound and 14 minutes after the previous airport-bound train departed), so there’s no gap in Red Line service after Train 45 is done. This type of process is repeated for several trains (e.g. Red Line Train 51 comes out of the Elmonica yard, arrives at BTC at 5:24pm, and essentially replaces Red Line Train 48 which leaves PDX, goes to Willow Creek, and then back to the yard out of service). Overall this arrangement works well – Red Lines bringing passengers further west than BTC during rush hour takes some of the pressure off of westbound Blue Lines, which otherwise could potentially pick up another train’s load of people onto already crowded trains at BTC. The timing doesn’t seem to affect eastbound passengers because Blue and Red trains are still passing through at the same frequency, the only difference is that boarding isn’t done in the pocket track for the Red Lines since they come through in the eastbound main track. Now, the budget tool doesn’t go into any of this, it just says that the Red Lines would only run to Beaverton during rush hour and terminate at 11th Ave or Gateway otherwise. So then I wonder how the scheduling of those runs would work.. would any of the the rush hour ones continue to go further west than BTC? I’m assuming fewer Red Line trains overall would be needed to maintain the same frequency of trains to the airport, so maybe not. For the passengers’ perspective, I also wonder about crowding conditions. According to TriMet’s ridership statistics in November, MAX (all lines) weekday trips were 124,900 and rush hour trips were 38,300. 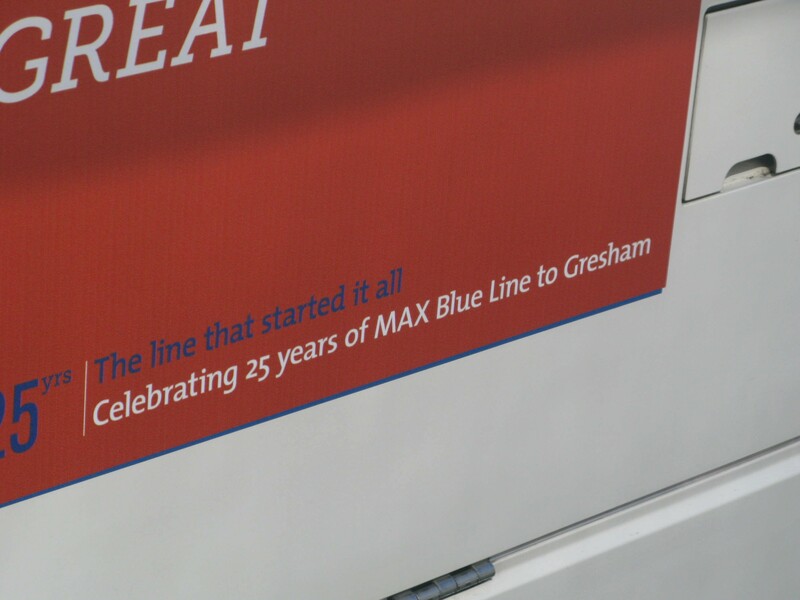 Which means that 86,600 weekday trips on MAX are not during rush hour. I don’t have ridership statistics from the early years of the Red Line handy, but I’m assuming that ridership on the Blue Line & Red Line are higher now then they had been when decisions were made to extend the Red Line to Beaverton in the first place (heck, I remember at least 5 years ago discussions around extending the Red Line to Willow Creek due to passenger loads!) Granted the Red Line isn’t a crush load in the middle of the day, but it’s not empty either, and this would put heavier passenger loads on Blue Line trains. Additionally, if the decision is made to have Red Line stop at Gateway, the infrequency of east/westbound trains downtown (15+ minutes between trains) would certainly have an impact on ridership and customer satisfaction. And there are other costs to consider if Red Line changes are made – road relief pay if the decision is to terminate at 11th Ave, as well as a Wackenhut or other transit officer on the platform at Galleria to clear the cars before the train goes into the terminus, etc. Fare enforcement on the rise at TriMet! More supervisors, more code enforcement, more citations. If you get a citation, it’ll cost you $175, and your odds of not getting caught have gotten worse. According to KGW, an average of 250 people are still showing up in court every “TriMet Tuesday” to try to get the fine reduced or do community service instead of paying. Yes, the ticket machines are still a problem, but I doubt that a broken ticket machine is the reason why every one of those 250 people didn’t pay their fare. Alternatively, we could just roll like Scotrail. You might have seen this video of the “big man” who grew weary of a fare evader arguing with the conductor and physically removed him from the train (to the applause of other passengers). A bit vigilante justice, perhaps, but there’s no excuse to mouth off to a conductor either and delay a train full of people because you think you’re above paying. First, test your knowledge! How many MAX stops can you name in 10 minutes? No extra credit given if you can do each line in order, but regular commuters should have an easy time with at least part of this. “If you were a restaurant, you’d be one of the places that looks all charming and rustic on the outside and then serves canned gravy and frozen beets on the inside.” Pic is mine, words are Dr Jeff’s. Also worth the read at TriMet Diaries by Dr Jeff is “The Tunnel: Threat or Menace?” I like the tunnel – it is a technological marvel, but I also understand that for a lot of passengers, it’s their least favorite part of the commute. I’ve got a lot of pictures that I haven’t figured out how to work into one post or another. This is one of them, and it’s a perspective most people don’t get to see. 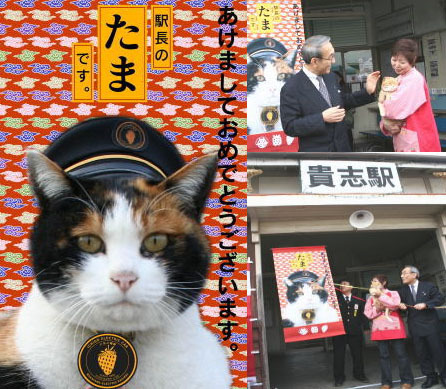 In Wakayama, Japan, a cat named Tama was named stationmaster of an unmanned railway station. According to Wikipedia, the position comes with a hat and she’s paid in cat food. She has an office (a converted ticket booth) and her primary duty is to greet passengers. Not a bad gig if you can get it, I guess. 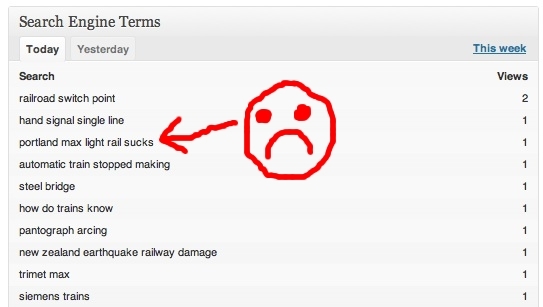 Over at Reddit, Portlanders discuss their transit fantasy line wish lists. Not all of it is TriMet related, but an interesting post for transportation wonks. 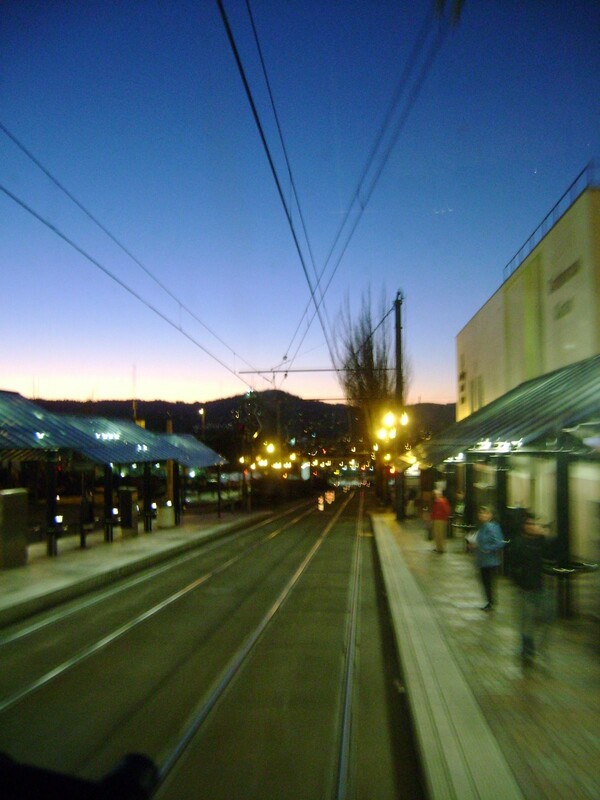 Bill Lascher started a project riding different TriMet lines and blogging about them. It doesn’t look like it’s been updated in a while, but you can listen to his entry on the west side portion of the Blue Line. Yachts on rails: FRNs with a half million dollars to spare buy their own private railcars and hitch them on to Amtrak trains. The gallery of photos is pretty nice. 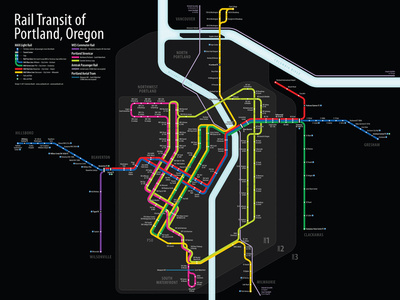 Graphic designer takes on map of TriMet rail system, and in my opinion, greatly improves it. More detailed pictures available at his blog. Firefighters periodically do training drills at the yards (link goes to a Portland Fire & Rescue blog post with pictures of a drill at Ruby) to familiarize themselves with the trains and practice how to rescue a person who has been struck by the train and is trapped under it. During a drill this past June, they were called into action when a person was struck by a train on Burnside. And finally, I liked this post from Punkrawker Blogs On: “Driving a Bus Is” I think it applies to transportation operators in general, not just bus operators, and it’s a nice overview of what it’s like.